What are you devoted to? What holds your hearts, your loyalty? What is first on your mind, in your hearts and on your lips? Maybe in this season of your life your devotion is directed to a someone. A young man or woman who has caught your eye and stolen your heart. Perhaps it is your children, my grandchildren, who are the object of your devotion. Your family is a good place to exercise devotion. My prayer for you all is that your one true devotion will be to the Lord. That He would capture your heart like no other. I long to hear that each of you are so lost in the Lord that your family needs to seek Him to find you. I promise you, my children, that a life devoted to the Lord will reap benefits beyond measure. Your marriage will be stronger, your love will be more abundant, and the peace you will have when the world around you seems to be in chaos…….. is worth every moment spent in pursuit of a passionate, devoted life to Him. I am gonna brag on someone for a bit. Why? Well, because this is my blog, and I can…. and every once in a while I just feel like bragging up on people who are important to me. Sisters in the faith need to build each other up…. so, here I go. This lady here is one of a kind. She is a dreamer, encourager, and lover of Jesus. She also happens to be my boss. ( And no, this is not an attempt to butter her up for a raise…lol) Today is her birthday and this is just my version of a card. Before she was ever my boss I thought she was pretty cool. She published this magazine that I had stumbled onto… the articles encouraged me. They recharged my passion to homeschool, especially on those day where you are ready to flag down the public school bus and hand them a few more kids. She dreams up stuff to bless homeschoolers with, gathers a team of people, gets them excited about her vision and leads the charge as everyone pulls together to make it happen. No one shares the same office. Most of us have never seen our coworkers, yet we function as a great big family. She keeps her finger on the pulse of 4 + different divisions…. homeschools…. travels with toddlers…. and manages to keep a really good sized family fed and watered. If you look up multi-tasking in the dictionary, I am quite sure her picture is there. She is a lover of Jesus. This is the quality that I admire in her most. Her family stuff, and work stuff, and life stuff….. have been a wee bit crazy at times…. and no matter what the circumstance…. she displays grace and lifts praise to God for who He is. Her faith is deep. Her heart full of worship. Her words full of encouragement. She is real. Just so you guys don’t start to think that she is a glowing tower of perfection….. she will be the first to admit…. that snuggles come before dishes and dust bunnies probably breed in the quiet spaces under the couch…. but sometimes that is just the way life is. Love counts for way more than a swept floor, perfectly folded laundry and sparkly plates. So dear boss-of-mine, my prayer for you today, on your birthday is that you continue to grow in God’s grace, to seek his wisdom for your life…. and that you have many, many more years as the chief snuggler of all your babies and one day grandbabies. I praise God for the woman He has created in you. Remember a few weeks ago when I told you I would be reviewing a book for one of my friends? Well, my review will post next week….. but I wanted to let you know about the Pre-Sale. The book is available now and for a few dollars less than its regular price. $4.95 is a bargain for this great study on Asia. 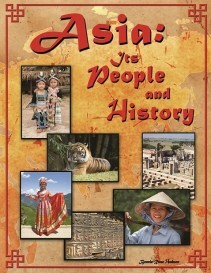 We have been using this book as a family devotional and it has been a wonderful trip through Asia. If you are looking for a great little family study this book might just be for you. You can click on the picture and be taken directly to the purchase page. I don’t receive any compensation for reviewing this product. I am just excited to share something a dear friend of mine wrote. Thanks for reading all the way to the end of the post. I told you I was impatient to read all about it, so the point, click, read version sated my instant gratification need…..I loaded it on to my kindle and parked on the couch to see what I could learn. I knew we needed healthy fats in our diet….. This is why I could never get behind all the low fat – no fat way of eating. Besides, I like butter….butter is good. As I read on, I found out I would be able to have the best of both worlds. Butter and bacon and also carbs that my body could take the time to digest without turning them into fat layer number three. I started with the very next meal…. That night I ate my first “S” meal. It was satisfying. (hence the “S” title) It was Steak and broccoli with a salad and my broccoli had butter…. it was so good! I love eating this way. I feel so much better. I no longer have a bloated belly… I have energy. I have an endless variety of foods that I can eat…. as long as I keep my meals with fats, separate from my meals with carbs. I started eating the Trim Healthy Mama way November 1st. I didn’t feel deprived over Thanksgiving…. or over Christmas. This month, the scale shows I have lost 35 lbs. I have lost inches too…. I was a size 18 (should have been a 20) in pants. I am now a loose 16…. and some 14′s fit. Never in my life has the scale moved in this direction. Ok, once…. when I never ate anything… and I was maybe 24. If you feel like to have to only eat certain foods to lose weight…. If you feel like you are fasting to lose weight….. Please consider buying this book and just reading it. The information in the first three sections apply to every human on the planet. You don’t have to be a Mama to change the way you eat…. and eat your way to a healthier self. I am excited to share with you something that a very dear friend of mine wrote. I will be using this book with the boys in the weeks to come and you can learn more about it by going to Bonnie’s website. The book is available February 24, 2014. Sign up here to receive information on pre-orders, discounts, and all the information on where you can purchase a copy.